You might have noticed that the look and feel of this blog, as well as those of my other social networks, have been changed. 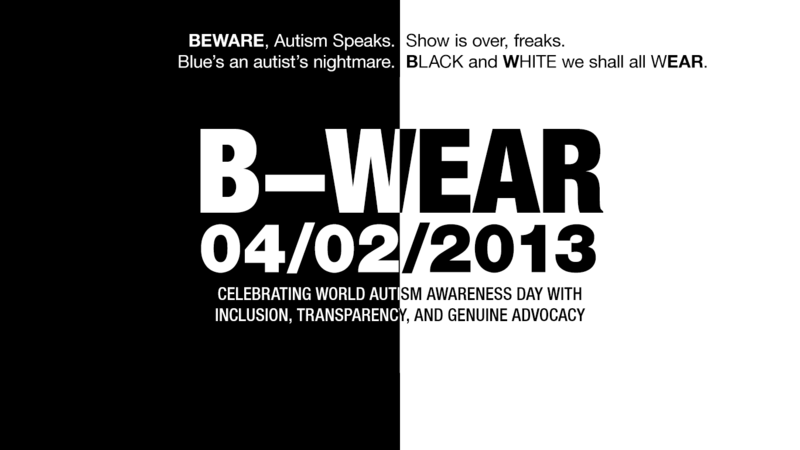 From the blue and white motif of this blog, I have changed it to black and white, in celebration of World Autism Awareness Day and in defiance against Autism Speaks. Blue has been my favorite color since childhood. As a matter of fact, many of my personal effects — from my clothing to my bedsheets, from my mouse to my entire room — are colored blue. But no thanks to the hypocrisy of the bigoted group of con artists known as Autism Speaks, I will for a certain period have to give up my passion for blue — in exchange for black and white. Enough about me, though. After all, this campaign is not just about me — it’s about every autistic self-advocate who wants their voice heard, amid the misinformed world at large. But why does a counter-event to Autism Speaks’s “Light It Up Blue” like B-WEAR matter to autistics and those who really support them? We autistics have had enough of being exploited and excluded. Autism Speaks has hijacked the UN-mandated World Autism Awareness Day and the color blue to promote their eugenic agenda. We need to stand up to and call out Autism Speaks’s nonsense. It’s about time we celebrate World Autism Awareness Day in our way — to promote awesomeness, not paranoia. Autism Speaks talks too much, and must simply be either driven bankrupt or destroyed. Now, I have noticed as well that there are similar counter-events to B-WEAR, like Shut It Up Grey, Tone It Down Taupe, and Autism Acceptance Day/Month, all which have a common goal: to remonstrate against the hypocritical ad campaign of Autism Speaks. I believe that B-WEAR perfectly complements with every counter-event currently being organized, and the goals that they push are something we can agree on together. As a matter of fact, some of my fellow bloggers don’t even think that Light It Up Blue is even an awareness campaign for autism, but rather a huge advertising campaign that Autism Speaks get pro bono. In other words, the bigots at Autism Speaks, being the mooches and free riders that they are, is taking advantage of social responsibility programs of corporations and governments in order to extort money to fund their vilification campaigns and pushing for extermination of autistics. I shall be posting some details later on how you can be part of B-WEAR. And unlike Light It Up Blue, you don’t really need to do anything else extra, nor do you need to shell out money to participate. And any autism and disability advocate, self-advocate, or common Joe can be part. All you need is a heart for transparency, inclusion, and genuine advocacy. A campaign in black and white. A campaign to beware.